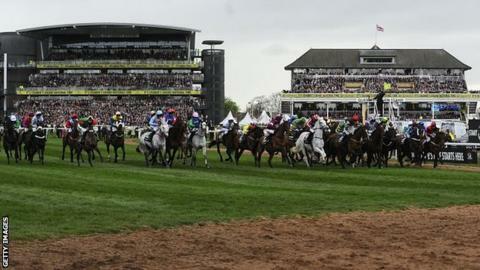 Grand National jockeys must wait to find out if they will be punished over the controversial start to Saturday's race and their later revolt. A British Horseracing Authority (BHA) inquiry looks unlikely to take place before the end of next week. All 39 jockeys in Saturday's race to officially learn their fate. They were angry that two-day bans for each of them were being considered over the busy Easter period. There was a false start to the race, which was won by Pineau De Re, because of Battle Group's reluctance to join the other runners. A stewards' inquiry began to look at the circumstances surrounding the false start, and the riders were accused of lining up too early, ignoring the starter's instructions and placing an official's welfare in jeopardy. Assistant starter Simon McNeill, a former jockey, was knocked over - although not badly hurt - as jockeys set off to race in the famous steeplechase. Barry Geraghty, who rode Triolo D'Alene, told At the Races: "It seemed to us that in the aftermath no common sense was applied and if ever there was an example of a sledgehammer cracking a nut, then this was it. "I think that as a group of sportsmen, us jump jockeys could never be described as prima donnas and we always try to conduct ourselves in the best interests of the industry. "There were men in that field who have won all the great races in the jumping calendar but they were treated like school kids." Jockeys could now face additional penalties for failing to attend the stewards' inquiry, in addition to any disciplinary action over the start of the race. A BHA spokesman said they were gathering information which would be assessed by the disciplinary department before jockeys were notified of the next steps. It is understood statements will be taken from all the officials involved, while television footage from the start and transcripts of the stewards' inquiry will also be studied. If any bans were imposed, it is likely they would not come into force in the final stages of the 2013-14 season, which ends on 26 April, but the quieter early part of the following campaign which begins the next day. Suspensions handed out by stewards at racecourses apply a fortnight from that day, while riding bans given out at disciplinary panels start a week later.